The below press release appears today at ASTRON and Jodrell Bank Observatory in Manchester, describing the first peer reviewed scientific results from the LOFAR telescope, from a team led by LOFAR-UK member Dr. Ben Stappers of the University of Manchester. The powerful new International LOFAR telescope, designed and built by ASTRON, is allowing an international team of scientists to have their “best-ever look” at pulsars: rapidly rotating neutron stars, created when massive stars die. In the first refereed scientific results from the new European telescope LOFAR (Low Frequency Array) soon to appear in Astronomy & Astrophysics, the scientists present the most sensitive low-frequency observations of pulsars ever made. Because of its unique design, LOFAR can observe in many different directions simultaneously. For this image, five pulsars, spread over the entire sky, were observed simultaneously. LOFAR is the first in a new generation of massive radio telescopes designed to study the sky at the lowest radio frequencies accessible from the surface of the Earth with unprecedented resolution. Deep observations of pulsars are one of its key science goals. The chance detection of the first pulsar in 1967 is considered one of the great discoveries in astronomy. Astronomers got their first glimpse of pulsars by using a radio telescope sensitive to frequencies of 81MHz (roughly the same frequency as a commercial FM radio station). 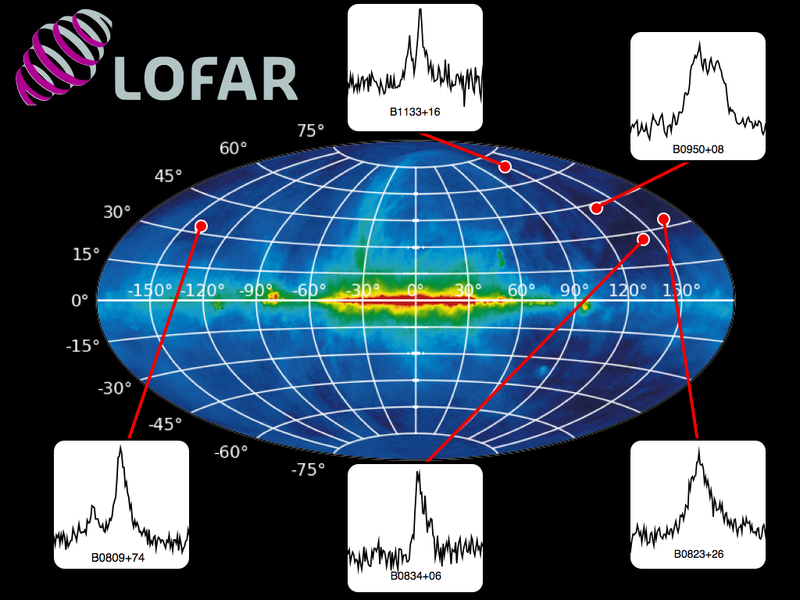 With LOFAR, astronomers have gone back to some of the same techniques used in the first pulsar observations, but have used modern computing and optical fibre connections to increase many times over the power of their telescope. This will allow LOFAR to analyse regular pulses of radio emission and probe such things as the physics of gravity and the properties of the material that pervades our Galaxy. LOFAR works by connecting thousands of small antennas spread right across Europe using high speed internet and a massive supercomputer near its central core at ASTRON in the Netherlands. The LOFAR telescope has no moving parts, instead relying on adding digital time delays to "point" the telescope in a particular direction. This approach offers a much-greater level of flexibility in the way astronomers can analyse the data. For instance, unlike a conventional radio telescope, it is possible to point in multiple directions simultaneously simply by having the computer crunch more data. For astronomers who want to search for new pulsars, this means they can scan the sky much more quickly. The team's next step is to harness LOFAR's capabilities to address some of the long-standing mysteries about how pulsars shine and also to discover nearby pulsars that were missed by past telescopes. "LOFAR has the potential to find all the undiscovered pulsars in the neighbourhood of the Sun and to reveal rare explosions in our Galaxy and beyond. We're very excited to see what's out there." says Dr. Joeri van Leeuwen from ASTRON. LOFAR is capable of detecting radio waves over a very large range of frequencies, all the way from 10MHz to 240MHz. As well as searching for pulsars, LOFAR will be used for making deep images, cosmology, to monitor the Sun’s activity and study planets. LOFAR will also contribute preparations for the planned global next generation radio telescope, the Square Kilometre Array (SKA). The International LOFAR telescope is a European collaboration, led by ASTRON Netherlands Institute for Radio Astronomy. By combining thousands of simple antennas with a powerful supercomputer, LOFAR can observe large parts of the sky very fast in different directions simultaneously on relatively unknown low frequencies. This opens up a new window to the universe for astronomers. See also: http://www.astron.nl/lofar-telescope/lofar-telescope.